On Thursday night February 2, we continued a series at St. Rita’s Parish called Faithful Citizenship – a Call to Political Responsibility from the Catholic Bishops of the United States. It was the second session of a three part series on Catholic responsibility in the political process. 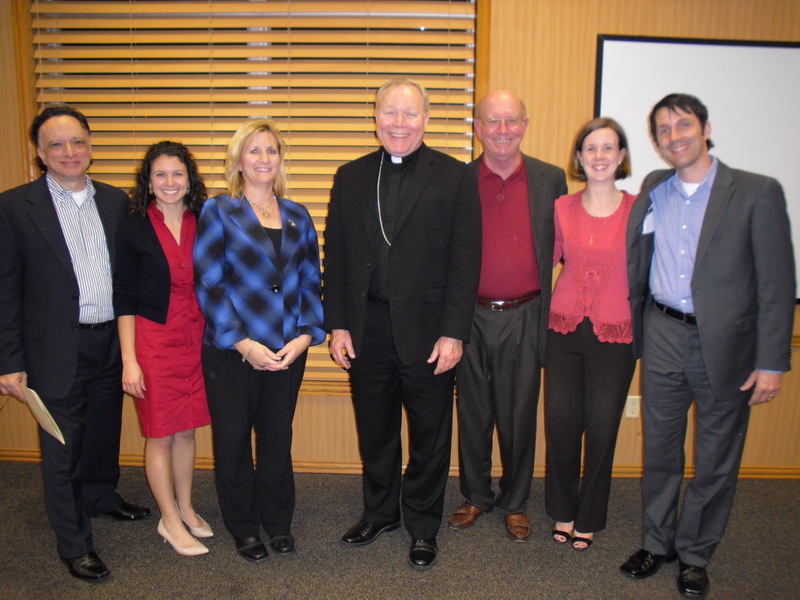 Bishop Edward Burns of Juneau, Alaska was our speaker with St. Elizabeth Ann Seton’s Justice Ministry, Catholic Charities of Dallas and The Catholic Pro-Life Committee of North Texas all playing host. It was a great evening during which we reviewed part 2 of the Faithful Citizenship document, enjoyed some Q & A with the Bishop and received a special presentation by the CPLC. Bishop Burns spoke honestly and with great insight encouraging Catholic engagement on the key issues before us today. Although much was shared during our evening together I want to reflect on a portion of the evening that spoke directly to my heart. During Bishop Burn’s presentation he encouraged Catholics to be engaged in the key “political” issues being debated in the public square. He not only encouraged our “engagement” but implored the laity to be leaders and to speak out on a wide variety of issues currently being debated. He discussed the HHS mandate, religious liberty, key pro-life issues, immigration, health care, etc. I enjoyed his presentation on the history of Church / State relations and appreciated his statement regarding the place in which the Church and State still meet today – the Voting Booth. It is in this space, among others, that our voices will be heard! I also appreciated the fact that Bishop Burns asked us to lead but asked us to be like Jesus in our leadership. We must be a people that stand up for the poor, cultivate a culture of life (home, parish, & public square), be kind to those seeking refuge in our country, and encourage needed solutions in the areas of health care, workers rights (both here & abroad), freedom of religion, and the creation of a fair and free economic system that benefits the common good. He encouraged us to participate in the political process as a moral imperative. Bishop Burns called us to live out our Catholic faith in public just as we do in our private lives. Finally, I want to state that I heard and listened to the questions being asked and the complaints being made during our evening together. To this I want to say, as a Catholic, I believe we have a personal responsibility to help our family / friends, Pastor’s and Parish Communities to be successful in the area of political (moral / social) responsibility. We cannot expect our Bishops, Priests and Religious to be alone on the forefront of this fight. We must be active participants, girded with a spirit of love & humility, in our communities – forming groups to inform folks about the issues. Together we can and will make a difference. May God grant us His peace in our day!